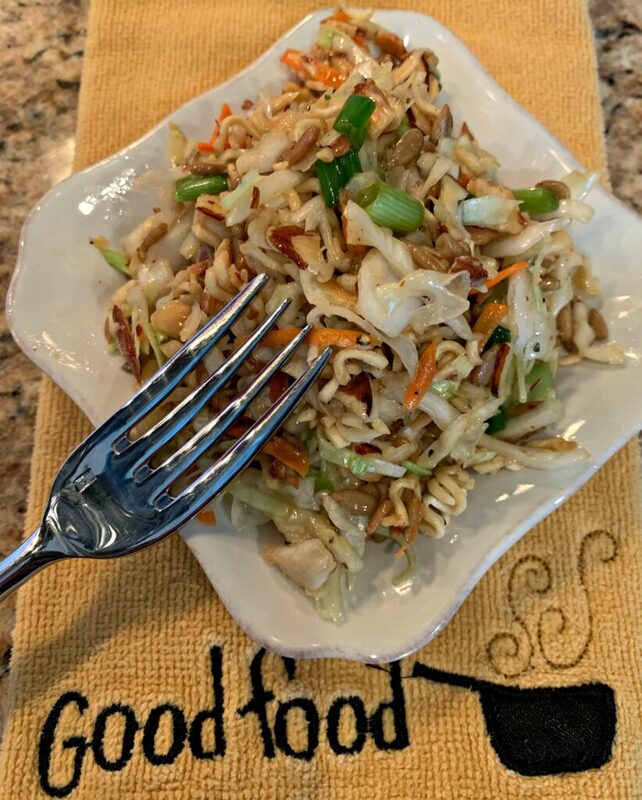 This tangy, crunchy, simple Ramen Coleslaw is packed with flavor and can be made in less than ten minutes! It disappears quickly because its so light and tasty! 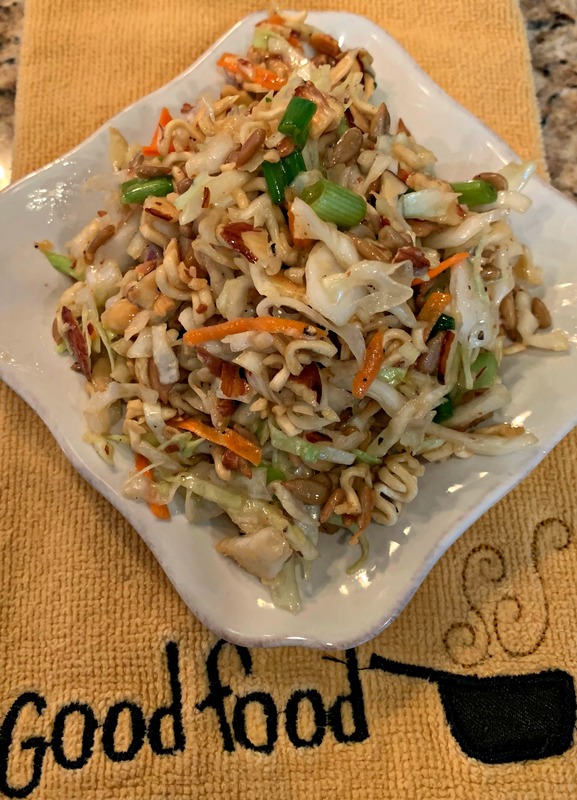 If you recently have scrolled through my blog, you will notice, my mom is on a kick with all the new recipes she has been passing my way. 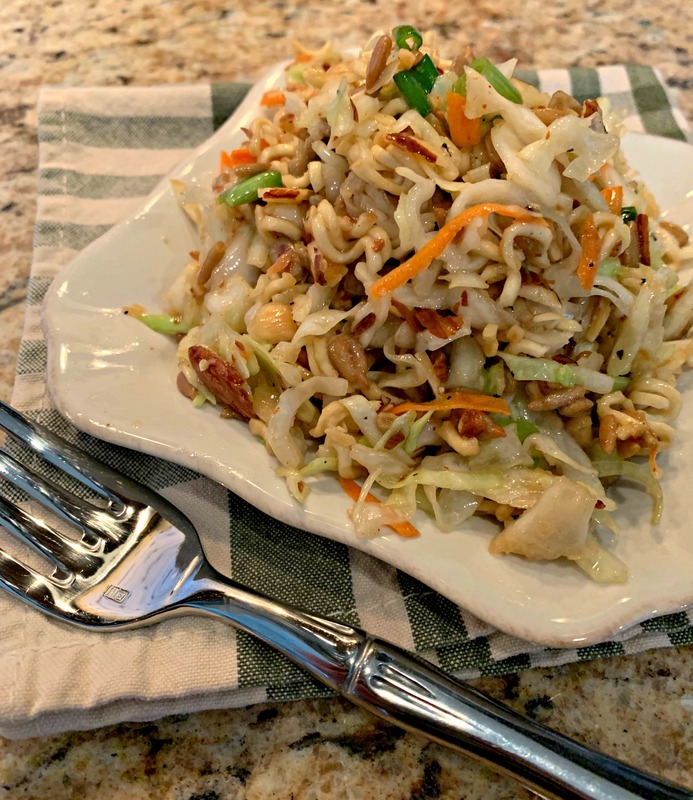 Soups, lettuce wraps, Brussel sprouts (coming soon), and now this tasty Asian Coleslaw. Last week, my mom had some of her friends over for dinner. She wanted them to try the PF Chang’s Chicken Lettuce Wraps so they could see how tasty they are! She ended up pairing this Ramen Coleslaw with the wraps and making a meal out of it. Everyone went crazy over the dinner and since she had made this coleslaw earlier in the day, everything came together quickly and easily! If you want a more “crunchy” coleslaw, pour the dressing and toss it together just before serving. Otherwise, you can prepare as directed below and store in the refrigerator! She put a small container aside so I too could try it, and I enjoyed it with my lunch the next day! Now, I paired it with the chicken pot pie soup she made, so probably a weird combo, but it was fantastic. I definitely knew why her dinner party was a hit! This coleslaw would be perfect for large crowds because of how budget friendly and simple it is to prep! You can save time and prepare this earlier in the day, so you have more time for company! 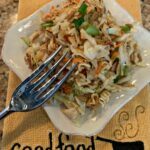 Whether you pair it with the Lettuce Wraps, or pair it with some Orange Chicken perhaps, this Coleslaw is the perfect side dish to serve! It would even be a great option for a potluck or picnic! Thanks again mom for yet another tasty recipe! In a skillet, toast the almonds in the butter. Set aside. Crush the Ramen noodles and combine with the cabbage, green onions, toasted almonds, and sunflower seeds. In a small bowl, combine the soy sauce, vinegar, oil, and seasoning packet from the Ramen noodles. Pour dressing mixture over coleslaw before serving. Keep coleslaw refrigerated until serving! Enjoy! I can’t wait to try this recipe. I love all that I see. Be sure to let me know what you think once you try it! Roughly what is the calorie count? Thanks. Nope, the liquid moistens these, but no need to cook! Have you ever added chicken to this? No, but as long as its precooked chicken, I bet that would be a great addition! It could be a meal in itself! Yum! !